by Lee Epstein, William M. Landes, and Richard A. Posner. Cambridge, MA: Harvard University Press, 2013. 440pp. Cloth $49.95. ISBN: 978-0-674-04989-5. Reviewed by Sara C. Benesh, Department of Political Science, University of Wisconsin - Milwaukee. Email: sbenesh [at] uwm.edu. There are many, many books written that attempt to explain judicial decision making, from a variety of theoretical viewpoints. What Epstein, Landes and Posner attempt to do, in The Behavior of Federal Judges, is integrate much of it into a treatise on federal judicial decision making from an economic perspective. Using data from all levels of federal courts (i.e., the U.S. Supreme Court, the U.S. Courts of Appeals, and the U.S. District Courts) and considering political science and legal research on various aspects of decision making, Epstein, Landes and Posner make the overarching point, via careful empirical inquiry, that judges make policy and are influenced by their ideology, but that is decidedly not the end of the story. Rather, judges are also workers, seeking leisure and promotion and good relations with their colleagues, superiors, and audiences, just like other workers, and that not all judges, not even all federal judges, behave in exactly the same ways. There is much here to commend to readers, especially those unfamiliar with the political science research on judicial behavior, and their overall theme – that neither law nor ideology alone explain judicial behavior – is well substantiated. I detail the contributions they make, along with my analysis of them, below. One obvious contribution of the book is the breadth of political science and legal scholarship discussed and analyzed. They carefully situate their rational choice perspective on decision making within the larger political science and legal academic literature such that one comes away with an enhanced understanding of the contributions and limitations of much of what has been written so far on the behavior of federal judges. A second contribution is the aforementioned focus on all federal courts rather than on just one. Even with increased attention to the Courts of Appeals, the U.S. Supreme Court remains the most frequent target of scholarly attention, and very few analyses attempt to study more than one level of the federal courts simultaneously. Their tripartite focus shows in stark relief what we suspect to be true: Ideology is differentially influential as one travels up the hierarchy, with District Court decisions least influenced by ideology and Supreme Court decisions most ideologically-driven. Of course, it is unclear whether that effect is driven by a selection effect (different cases) or an institutional effect (different motivations borne of different institutional designs). The analysis tracking the same cases as they travel up the pipeline (see Table 5.13) seems to suggest the institutional effect, though the authors continue to [*313] expect that case selection matters as well. And, the study generally demonstrates the operation of institutional differences among the courts via its focus on a labor-market model of judicial behavior. Ambition, for example, is influential on the decision making of lower federal judges, and not Supreme Court justices. In a novel analysis, the authors find that “auditioners” (i.e., Courts of Appeals judges that, due to their characteristics, have the best chance of being promoted to the Supreme Court) – similar to elected judges, actually – alter their behavior in criminal cases, voting more often against defendants in capital cases. (The District Court analysis is not as convincing, given data issues.) A desire for work-place harmony and effort aversion matters to circuit court judges, sitting in rotating panels of three and hearing a mandatory (and large) caseload. They find a “conformity effect” for circuit judges (i.e., that as the proportion of judges in the circuit becomes more Republican, decisions are more likely to be conservative); while I wonder whether there is a real desire to conform or instead some sort of attempt to avoid or consider reversal en banc (an idea they do entertain in Chapter 6 on dissents), their finding of a significant ideological influence that is, nonetheless, weaker than that found at the Supreme Court level, confirms theoretical expectations. Interestingly, as the authors point out, these findings all have ramifications for the usefulness of the voting record of Courts of Appeals judge for predicting voting on the Supreme Court. As they show in Chapter 6 on dissents, many of the circuit-judges-turned-Justices were significantly less likely to vote ideologically while on the circuit court than they did once elevated to the Supreme Court. In studying the District Courts, Epstein, Landes, and Posner raise the fascinating idea of a “paradox of discretion,” owing to their confirmation that the Courts of Appeals are deferential to the decisions made by the District Courts (often due to legally-binding standards of review). They argue that a paradox is created because the more deferential (legally-driven) the Courts of Appeals are, the more room District Court judges have to make decisions based on their ideology. Their analysis does not find evidence, however, that District Court judges in deferential circuits are more ideological, though the possibility of reverse causality (i.e., that circuits facing ideological district court judges are less deferential than circuits facing non-ideological District Court judges) seems possible here. Overall, the authors find a modest ideological influence on District Court decisions and some evidence of effort aversion and reversal avoidance. Studying the District Courts is difficult due to the paucity of data, so the analysis here is at the district level and not at the likely preferable individual-judge level. The book makes several other substantial contributions. Epstein, Landes and Posner conduct a couple of Supreme-Court-only analyses, modeling unanimity (often ignored by attitudinalists) and oral argument questioning (relied upon by many to predict decision outcome). They find that cases without dissent in the lower court, cases with intercircuit conflicts, non-civil liberties cases, cases that reverse the lower court, and cases involving judicial power – in other words, cases wherein the ideological [*314] stakes are arguably not high – are more likely to be decided unanimously (and ideology matters very little to their decision). (Their take on conflict cases – that they are not ideologically-charged but are rather cases that the Court feels obligated to take – is not one I had considered.) Casting questioning at oral argument variously as a substitute for deliberation, as a means of filibustering good arguments (a neat idea), and as expression having its own utility, they find that questions are good predictors of votes. It is unfortunate that these analyses cannot be extended to the other levels of the federal judiciary, consistent with their tri-level focus (and the oral argument chapter, on its own, is a bit of an uncomfortable fit with the rest of the book). In addition, they do a lot of data work and make all of their data sets available via Epstein's website . While I would be interested in a more in-depth discussion of the “corrections” they made to the major courts databases (which essentially involved moving certain cases out of an ideological classification and into an unclassifiable one), it is a huge service to scholars to offer up the fruits of their labor so freely. They also create a new measure of ideology before appointment for all judges (and make this database available as well), using biographical and other information available at the time of the appointment to categorize judges as strongly conservative, moderately conservative, moderately liberal, and strongly liberal. They demonstrate the validity of their measure by compiling it for Supreme Court justices and comparing their scores with extant measures, but we are not given enough information about the construction of the measure to completely evaluate its utility. (What kind of information is relied upon, from which sources? Are any ideologically biased? Is there variation in the amount of information available across judges?) And, the categorical nature of the variable is disappointing (as are all instances of data reduction in the book). Finally, they end with a chapter full of future research ideas about which many graduate students in political science will likely get very excited (and should! ), including studying the influence of judicial staff on decision making, the use of plain meaning analysis as a time-saver, and the hierarchical ramifications of the Supreme Court’s diminishing caseload, among many others. Overall, this is a solid piece of research, much of it original to the book, and it ought to be quite useful in convincing those still holding onto the legal model of decision making that it is just not supported by the evidence. Indeed, that audience – presumably those in the legal academy, practicing lawyers, and maybe even the judges themselves – have the most to gain from the book. There are things here, as well, to challenge the ideology-only school of judicial decision making, though much of that evidence is at the lower court level where not even the true believers negate the influence of forces other than ideology. Treating the judge as a worker is a new conceptualization with much face validity and it leads to some interesting analyses attempting to uncover leisure-seeking, promotion-seeking, and conformity-seeking behavior, even if [*315] some of that evidence is not particularly surprising and some it is debatable. In the end, it is unclear how much we really gain via the labor-market model. But it is unmistakable that this book is a fantastic synthesis of what we know about federal judges, complete with original tests of some important gaps in our knowledge, placed into the context of the federal judiciary writ large through the lens of realism. 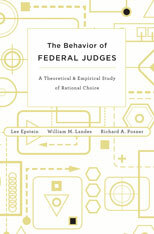 The authors assert that “this book is the fullest statistical study of judicial behavior of which we are aware (and the only one, we believe, to consider all three levels of the federal judiciary and their interactions to be thoroughly grounded in a realistic conception of judicial incentives and constraints)” (p.387). I can go along with that.